The team continue to make good progress. All the new data sources originally identified have been added to the HALOGEN database. The second iteration of the ‘web based enquiry’ development was presented to Nottingham users in late June and to the Roots of the British/Diaspora researchers at Leicester in July. Feedback from these sessions has been used to enhance its presentation and functionality. A prototype of the business objects based data extraction tool has been delivered to researchers at Leicester and they are evaluating its use. A visit from David Flanders - JISC Programme Manager occurred on the 2nd August and highlighted a number of hot topics (most notably data licensing issues and ideas on how to test our deliverables). The feedback from this session was very positive. 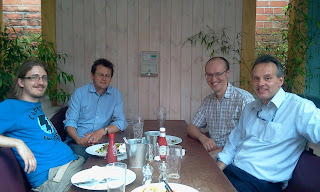 Photo below - left to right: Olly Butters, Andrew Bradley, Jonathan Tedds and Dave Carter. Olly has created a web interface that plots our data on to Google Earth satellite images. Our data is aggregated to the centre of BNG 1km squares to preserve confidentiality and to standardise the resolution of our database as there are several different data sources to compare. I am concerned that end users may forget / not read the project documentation and think that a point marks the exact location of data when in reality it could be anywhere in a km square around the point. Does anyone else share these concerns - or have a way of reminding an end user of this?